Be the first to share your favorite memory, photo or story of D.. This memorial page is dedicated for family, friends and future generations to celebrate the life of their loved one. 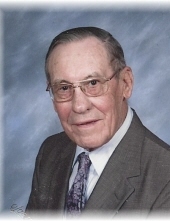 D. James McCray, 94, of Bowling Green, Ohio passed away Sunday January 27, 2019. He was born January 30, 1924 in Corry, Pennsylvania to Clifford B. McCray and Ethel (Walker) McCray Mitchell. He married Bonnie Ulrey on October 21, 1945 and she preceded him in death June 6, 2004. Jim was the Director of Buildings and Grounds for Bowling Green City Schools for 30 years, retiring in 1987. He was a member of First Christian Church in Bowling Green. He is survived by his daughters Ruth Ann McCray of Bowling Green and Sue (Rob) McCabe of Delmar, New York, brother-in-law Bill Harrison and sister-in-law Barbara (Larry) Schafer. He is also survived by numerous nieces and nephews. Along with his wife Bonnie, Jim was preceded in death by his parents, step-father Leonard E. Mitchell, step-mother Harriet Simpson McCray, brother Roger M. McCray and sister Cynthia E. Fletcher. His funeral service will be held on Friday February 1, 2019 at 12:00 p.m. at First Christian Church, 875 Haskins Road Bowling Green, Ohio 43402. Pastor Matt Every will officiate. Interment will follow at Plain Township Cemetery. Visitation will be held Friday morning at the church from 10:00 a.m. until the time of the service at Noon. Funeral arrangements have been entrusted to Dunn Funeral Home in Bowling Green. Memorial contributions may be given in his memory to First Christian Church or Bridge Hospice, 1069 Klotz Rd. Bowling Green, Ohio 43402. To send flowers or a remembrance gift to the family of D. James "Jim" McCray, please visit our Tribute Store. "Email Address" would like to share the life celebration of D. James "Jim" McCray. Click on the "link" to go to share a favorite memory or leave a condolence message for the family.